We were all so happy in reaching the difficult to climb summit of Mount Sicapoo. To celebrate the successful climb to the highest peak in Ilocos Norte, the first mass ever conducted in the area was celebrated by Bishop Sergio Utleg, the climb leader. He brought his materials to the mountain to celebrate it. 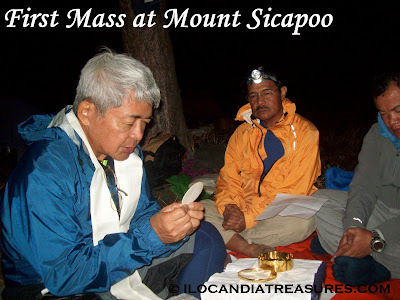 All of us mountaineers and including the guides and porters joined together to hear the mass. After taking our dinner then we held the mass and later on we had socialization party.